Do younger women with non-metastatic and non-inflammatory breast carcinoma have poor prognosis? Controversy abounds over whether breast cancer in younger women is more aggressive than those in older. The aim of the study was to assess the influence of age on long-term survival of women with breast carcinoma. Patients with non-metastatic and non-inflammatory invasive breast carcinoma treated at the Regional Cancer Centre, Trivandrum, Kerala, India during 1990–93 were divided into 4 age groups as < 40 years, 40–49, 50–59, and > 60 years. 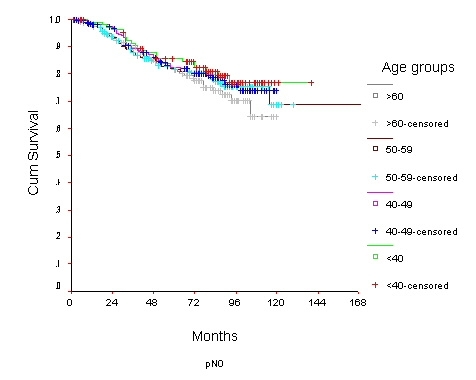 The overall survival (OS) for each age group was estimated using the Kaplan-Meier method in relation to the primary tumor (T) and the axillary node status (N). The OS of the various age groups were compared using the log-rank test. Hazard ratio and 95% confidence interval for each age group was estimated using Cox-regression model after adjusting for T and N.
Between 1990–1993, 1701 women (26%, <40 years) reported with non-metastatic and non-inflammatory invasive breast carcinoma. Overall survival (OS) of all the women was 52.6 % (standard error 1%) at 10 years. The OS for women with age < 40 years and with T3 and T4 disease status was 36.6% and 10.4% respectively and for those in 40–49 age group was 41.9% and 33.5%. The 10-year OS for women with node positive (N1) disease was 24.6% in < 40 years and 45.2% in the 40–49 age group (p = 0.0006). After adjusting for tumor and node stage the relative risk for death was 24% lower for women in 40–49 age group as compared to women <40 years of age. Women under 40 years with T3/ T4 breast lesions and/or positive axillary nodes were found to have a significantly poorer survival. The effect of age on survival in women with breast carcinoma is controversial. Several studies have reported that younger age to be associated with poorer prognosis when compared to older patients [1–6]. Other studies have reported that younger women have a better chance of survival [7–9]. There are reports of peri-menopausal women having a good prognosis [4, 10–12]. However, in a few studies, no significant correlation between age and prognosis has been obtained [13–15]. It remains unclear as to whether the different outcome of treatment seen in the various age groups is a reflection of aggressiveness of the disease and underlying tumor biology. Thus the effect of age on prognosis still seems controversial. The aim of the present study was to assess the influence of age on long-term (10-year) survival in breast cancer patients treated at Regional Cancer Centre (RCC), Trivandrum, Kerala, India. The results were controlled for the extent of disease at diagnosis (T and N stage), which is a major determinant of survival. Between 1990–1993, 1701 women with non-metastatic and non-inflammatory invasive breast carcinoma were treated at RCC, Trivandrum. The follow-up period lasted until December 2000. Women were grouped according to age into <40 years, 40–49, 50–59, and > 60 years. Diagnosis and treatment particulars were abstracted from the patient medical records. Tumor size was classified into T1 (< 2 cm. ), T2 (2 cm. to less than 5 cm. ), T3 (5 cm. or more) and T4 (any size with direct extension to chest wall or skin) and Tx, if the details of the primary tumor were not known (UICC-TNM classification). Lymph node status was histologically assessed and was classified as node negative and node positive. All patients had undergone surgery and/or radiotherapy with or without adjuvant chemotherapy and/or hormone therapy as per the institutional protocol. Information on patient outcome was obtained through periodic follow-up of patients at RCC, Trivandrum. The information on lost to follow-up patients was obtained through repeated reply-paid postal enquiry. As this was not cause specific survival estimation, all causes of deaths were accounted as 'event'. All other patients were 'censored' as on December 2000. The follow-up time was calculated from the date of diagnosis. 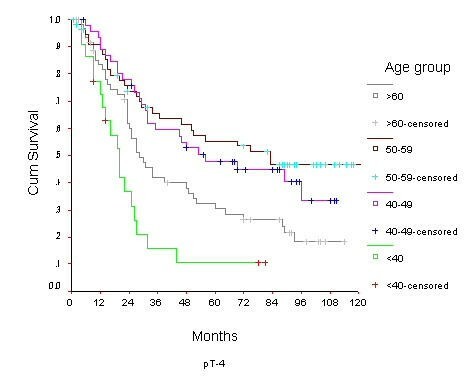 The OS for the various age groups were estimated in relation to the primary tumor (T) and the nodal status (N) using the Kaplan-Meier method . The OS of these age groups were compared using log-rank test. Prognosis (hazard ratios and 95% confidence interval) of each age group was estimated using Cox-regression model  after adjusting for T and N.
The data collected were grouped into 4 according to age: < 40 years (n = 437), 40–49 years (n = 557), 50–59 years (n = 433), and > 60 years (n = 274). The median age was 46 years (range: 21–90 years). The median follow-up was 66 months. At the end of the study period, that is December 2000, 640 (38%) patients were dead while 556 failed. Of these 556 patients, 125 (22.4%) had metastasis in bone (7.1% spine), 41 (7.3%) in liver, 40 (7.1%) in lung, 34 (6.1%) in brain, 20 (3.5%) in opposite breast and 169 (30.3%) had multiple metastasis. The rest 127 failed locally (22.8%). The distribution of patients in each age group by T and N is summarized in Table 1. Node positivity was higher among women under 40 years (60%) as compared to women > 60 years (55%) (Table 1). This difference, however, was not statistically significant (p = 0.12). The 10-year OS for the whole group was 52.6% [standard error (SE) 2%] (Figure 1), it was 46.5% for women with age <40 years and 59.8% for the 40–49 years age group (p = 0.0001) (Table 2) (Figure 2). Survival for the above four age groups was estimated in relation to T (Figures 3, 4, 5, 6) and N (Figures 7 &8) (Tables 3, 4, 5, 6). 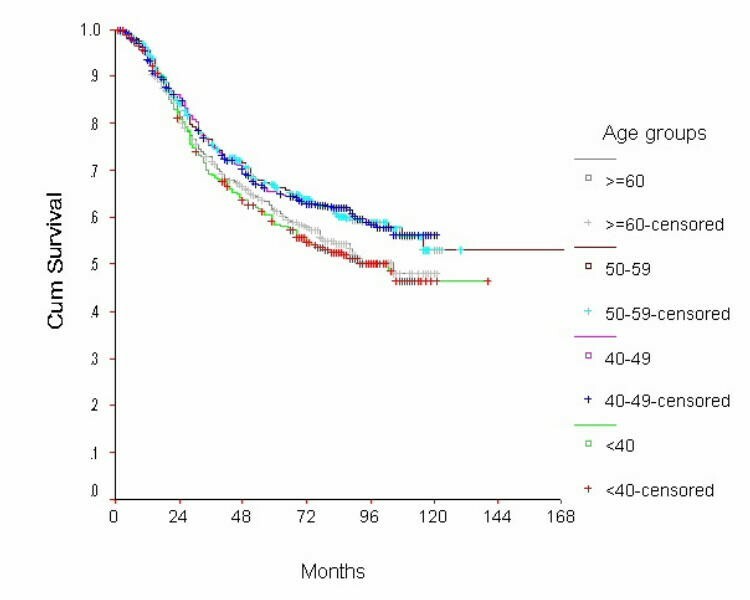 In women aged <40 years, and >60 there was a significant drop in survival in T4-stage. However, this was not seen in women aged 40–49, and 50–59 years and in patients with T1 to T3 disease. 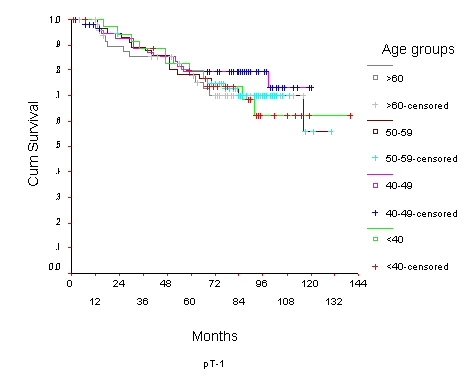 When T-status alone was considered, those under the age of 40 years and with T1, T2 disease had a 10-year OS of 62.3% and 58.3% respectively (Table 3). For those presenting with T3 and T4 lesion, the 10-year OS was 36.6% and 10.4%. In the 40–49 age group, the 10-year OS was 41.9% and 33.5% for T3 and T4 lesions respectively (Table 3). There was no significant difference in survival by age among patients with T1, T2 and T3 tumors, however patients with T4 lesion showed significant difference in survival between those <40 years and other age groups (Table 4). The 10-year OS for women < 40 years with node negativity was 76.8% in contrast to 24.2% for those with node positivity (Table 5). Absence of axillary nodes showed a significant difference in outcome among the various age groups (p = 0.01) (Table 5). However, women under 40 years with positive nodes had significantly poorer survival in comparison with women aged 40–49, and 50–59 years (p = 0.014 and p = 0.019 respectively) (Table 6). 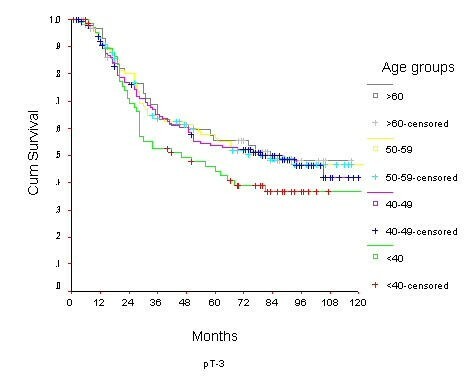 Non-metastatic and non-inflammatory breast carcinoma: survival by different age groups (figures in parenthesis denotes %standard error). 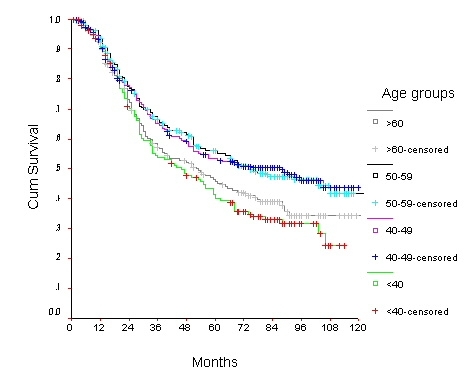 Non-metastatic and non-inflammatory breast carcinoma: Overall Survival(%) of different age groups by nodal status (figures in parenthesis denotes standard error %). Non-metastatic and non-inflammatory breast carcinoma: Log Rank Statistic and the corresponding p-value (in parenthesis) adjusted for pathological node involvement. In the present study of women with breast carcinomas we have observed that the prognosis was worst in women aged < 40 years and best in the 40–49 years of age group after controlling for T and N.
The influence of age on the prognosis of breast cancer still remains controversial. Several studies based on registry data showed poor prognosis for patients aged less than 35 or 40 years as compared to the older patients [2, 4, 6, 10, 18–27]. In the present study, the survival was lower in women under 40 years, with node positive disease and T3/T4 lesions. Holli et al. 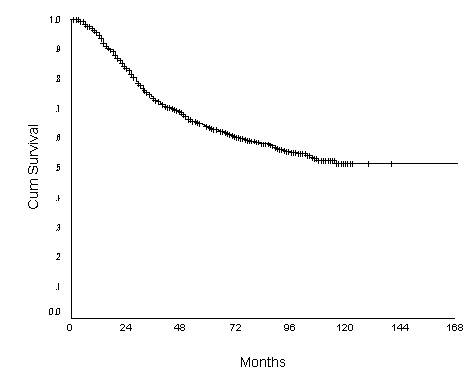 found the poorest 10-year relative survival rates for node-positive disease in women less than 35 years of age. It is difficult to discern the biologic reason as to why the occurrence of breast cancer in young women is the worst. Some hereditary factors may suggest the poor prognosis. It has been suggested that the poor prognosis of younger women is due to underlying pathological factors. Younger women have been shown to have a higher likelihood of lymphatic invasion , extensive ductal carcinoma in-situ in association with the invasive component , estrogen receptor negativity  and grade 3 histology . However, despite controlling for these factors the difference in survival remains the same between various age groups as is seen in the present study. 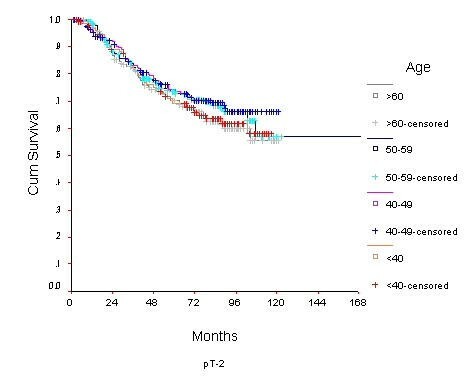 In the present study we observed that women with age >60 years and T4 disease had lower survival. This could be due to less aggressive treatment received by this group of women. Chemotherapy and radiotherapy are much more commonly used to treat younger patients. Older patients are often not keen to undergo more invasive therapies, due to unique social fabric. More over, some of these may have only a limited life span from coexisting disease or may have cardiac contraindications to undergo intensive cytotoxic therapy. In the present study the best prognosis was observed in the age group of 40–49 years after controlling for T and N. Other studies have also demonstrated that women aged 40–49 years have the best prognosis [19, 21]. The contrast in survival observed in the present study between patients aged 40–49 and younger than 40 years are remarkable. The treatment procedures in these age groups are essentially the same and their difference in outcome may be related to the menstrual status, the former group being peri-menopausal. In conclusion, the general observation that young women with breast cancer have a poorer outcome is established in this study as well. Even though the suggested reasons for this poor outcome are logical, more biological information and integration of genetic treatment in addition to chemotherapy and hormone therapy is the only answer to improving their outcome.